I’m going to come right out and say it – I’m not a chocolate fan. On any given day I’ll surely take a scoop of vanilla ice cream over some chocolately chunk creation. I’d say that at least 10% of the population agrees with me on this one, but we’re definitely in the minority. 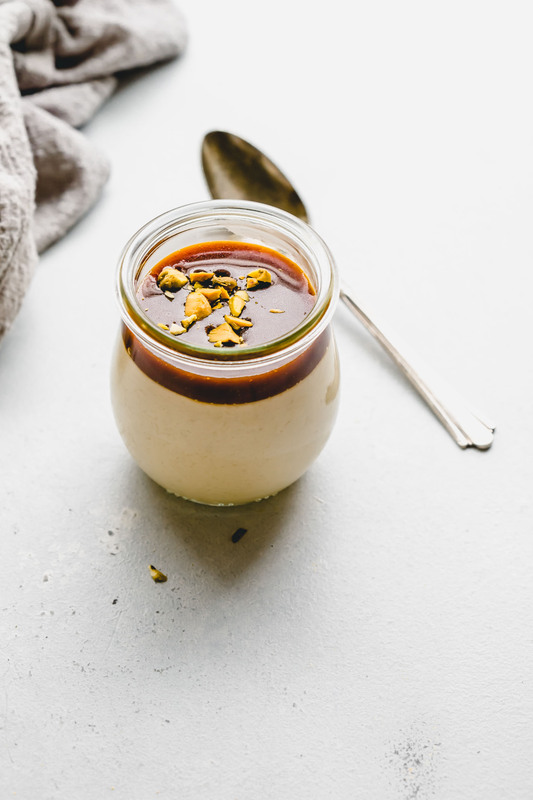 But today, I’m sharing with you a recipe for a Butterscotch Bourbon Budino with Salted Caramel that is guaranteed to knock the socks off even die hard chocolate lovers. 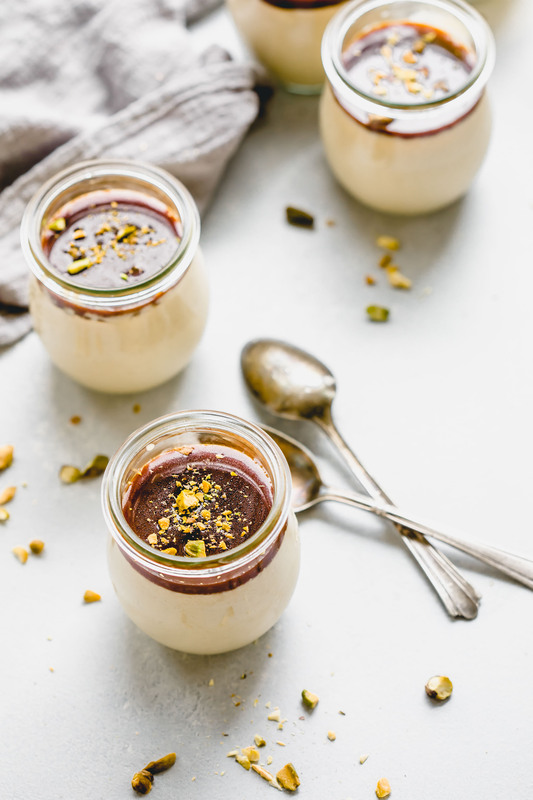 Budino is basically a fancy word for pudding. It’s an Italian custard with a thick and creamy texture. I first learned about budino in this cooking class that I took at Dobbes Estate Winery. We made a chocolate hazelnut budino with fresh whipped cream. And, while it was amazing, this non-chocolate fan was dying to try it in a different way. Enter butterscotch and bourbon… and just because we can, some salted caramel for good measure. 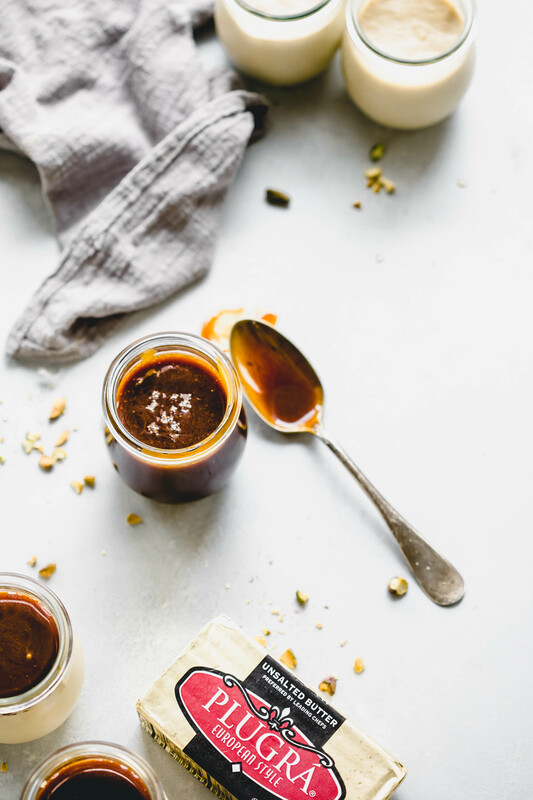 I’ve talked about my salted caramel sauce before, and my husband’s obsession with it. 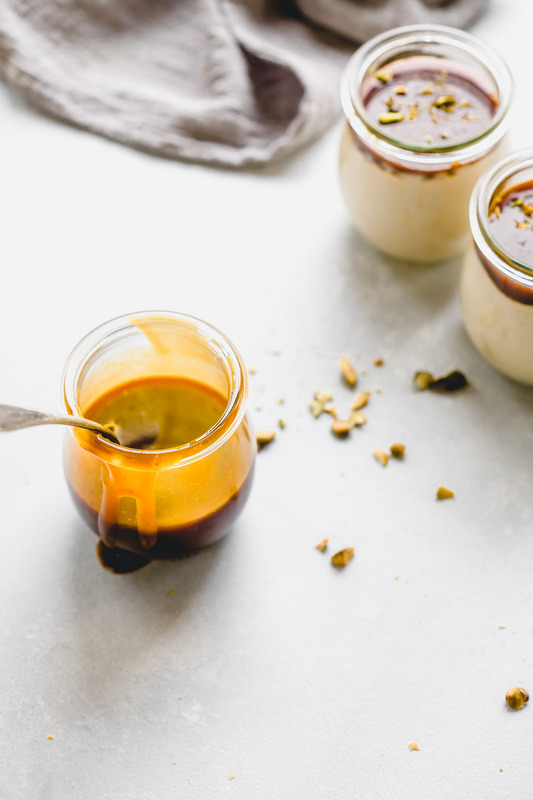 It’s easy and quick to make (just 15 minutes) and it’s the most buttery, yummy caramel sauce that you’ve ever tasted. To make the flavor truly shine, I like to use a high-quality butter, like Plugrá®. It’s slow churned with real milk from American dairy farms, so it’s extra creamy. Plus, there are no artificial ingredients or added hormones. You can really taste the difference it makes in both the salted caramel sauce and the custard for the butterscotch budino. And, just like the salted caramel sauce, the custard for these butterscotch budinos is simple to make. The most time consuming part is waiting for it to chill after the cooking process. It’ll take at least 4 hours. Because of this, I generally like to make them a day or two ahead of when I plan to serve them – I just divide the custard among some small serving jars, and place them in the fridge. They’re almost like a fancy pudding cup. The salted caramel sauce can be made ahead of time as well, even up to a week beforehand. 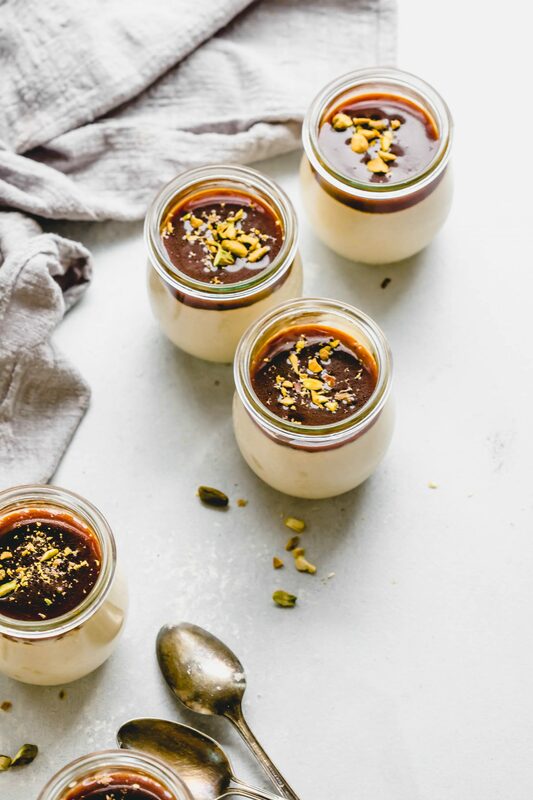 When you’re ready to serve, simply heat up the caramel, drizzle a bit over each budino and top them with a dollop of whipped cream and a sprinkling of pistachios. If you sample the custard on its own, you may be surprised when you’re cooking up the custard that it really doesn’t seem too sweet. It’s got a mild flavor, with just a hint of sweetness, that makes it easy to eat spoonful after spoonful. It’s that salted caramel on the top gives it an extra oomph and makes it just so yummy without being a major sugar bomb. It’s just the right balance of sweet, creamy and salty that makes it overly simple to say “yes” to seconds. This Butterscotch Bourbon Budino with Salted Caramel is like a pudding cup for grown ups. It's a rich and creamy indulgent treat that's not overly sweet. Combine heavy cream and milk in a large bowl. Whisk together egg, egg yolks and cornstarch in a medium bowl. In a large pot set over medium-low heat stir together brown sugar, water and salt until sugar dissolves. Increase heat to medium-high and allow to boil without stirring, until the mixture turns thick and dark amber in color, occasionally scraping the sides of the pot with a rubber spatula, about 7 minutes. Immediately add in cream mixture and whisk to combine and dissolve sugary bits. Bring mixture to a boil, watching pot carefully to avoid boiling over, then reduce heat to medium. Whisk half of this hot caramel mixture into the egg mixture. Return mixture to pot and whisk to combine until custard boils and thickens, about 2 minutes. Remove from heat and stir in butter and bourbon. Divide custard among ten 6-ounce glasses or cups. Chill uncovered until cold, about 4 hours. Spoon 1 tablespoon caramel sauce over each budino and top with a dollop of whipped cream. Finish with a sprinkling of chopped pistachios. If you loved this Butterscotch Budino recipe I would appreciate it so much if you would give this recipe a star review! Also, be sure to snap a picture of your finished dish and share it with me on Instagram using the hashtag #platingsandpairings and tagging me @platingsandpairings. 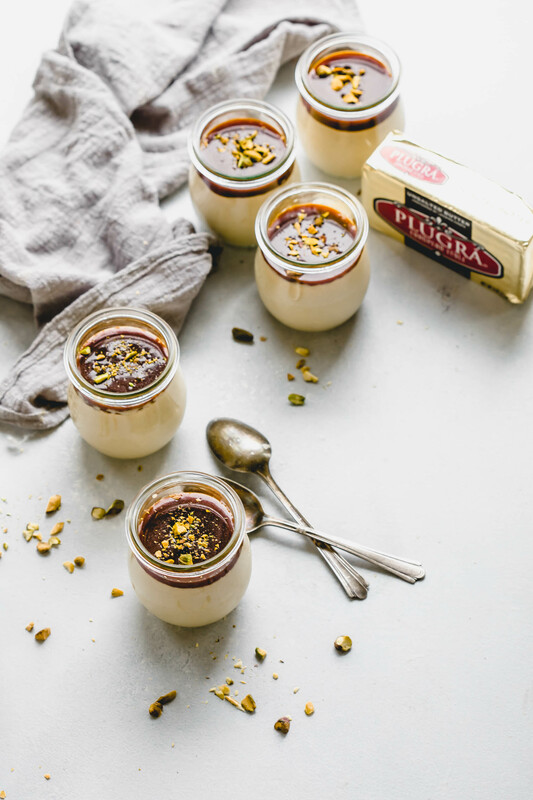 Tawny Port is one of my favorite wine pairings for creamy, custard dishes – It’s hints of caramel and slight nuttiness pair nicely with the flavors in this butterscotch budino. I teamed up with Plugrá® to bring you this post. As always, all opinions are my own. These are like works of art! So beautiful and sound like delicious creations. Your photography is always excellent, too. Just wow! Thank you so much Suzannah. Cheers! Looks delicious. I would lick the countertops. I had a similar dessert at a restaurant recently and have been craving it. Yours looks so beautiful and sound amazing!! Forget red wine and chocolate, THIS is what I want for dessert tonight…Beautiful!!! This dessert look so lovely! I love all desserts! And although I may prefer chocolate, I’d forgo it for this delicious butterscotch, bourbon custard. Yum. Wow! These are GORGEOUS!! I have never had custard before so I feel like I need to change that. 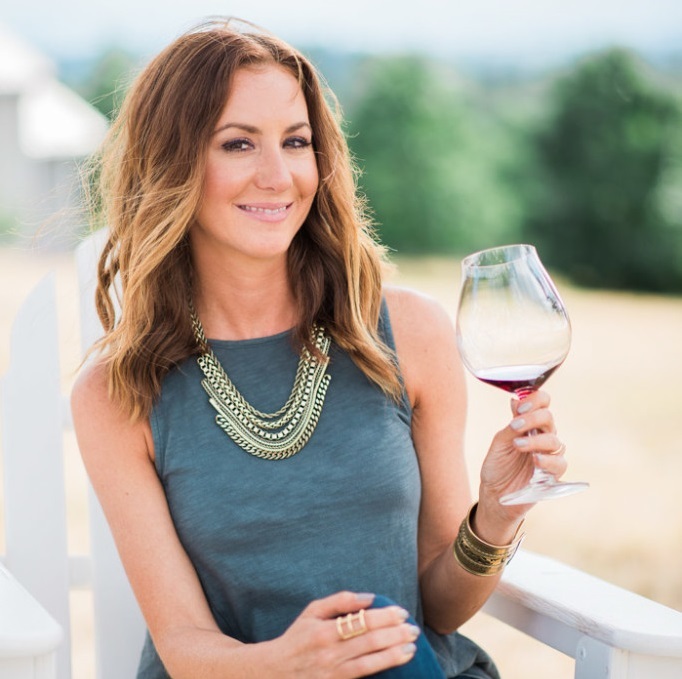 Thank you Jenna – Yes! I hope you give these a try – So delicious! Oooooo I love me a budino! This is gorgeous! Is there a certain bourbon you suggest or like to use for these? Good luck!!! These Butterscotch Budinos are sure to win anyone over! I would go ahead and use any bourbon – Since the amount used is so small, the brand won’t make much of a difference. Looks great! Is it fine to top with carmel and them refrigerate for a few hours or should I wait till just before serving? Hi Jessica – I’ve prepared these ahead of time, with the caramel on top, and placed them in the fridge and they were just fine that way. It shouldn’t be a problem at all! Enjoy! Where did you get the budino/custard cups? I want them! Hi Sandy – You can find the Weck Jars here. Would these work as a make ahead dessert? I’m looking for something that will last 24 hours in fridge before I can serve it. Definitely! These are a great make ahead dessert!